As 1,600 Palestinian political prisoners enter into day 25 of their freedom and dignity hunger strike their health is quickly deteriorating and tensions on the ground are increasing. This afternoon in solidarity, approximately 1000 men, women and youth gathered and peacefully marched towards the checkpoint close to the DCO offices and Ofar detention center. 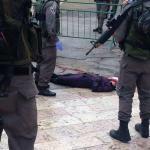 1- The young girl Dania Jihad Arshid (17) was executed by the Israeli Forces at the military checkpoint near Ibrahimi Mosque. One of the eyewitnesses who was standing in line, just 4 meters far from the checkpoint said that the soldiers had searched the girl’s bag and her personal belongings and put her through the metal detector but they did not find anything dangerous material with her. The soldiers asked the girl: ‘where is the knife?’ She replied: ‘I’m not carrying a knife’, then one of the soldiers shot a bullet between her legs terrifying her, so she took a step back and put her hands in the air and kept saying: ‘I’m not carrying a knife!’ but the soldiers shot her dead with 8 to 10 bullets in the chest and the neck. 1. Deaths: Hoda Mohamed Darwish, 65-years-old, died after inhaling tear gas that was fired by the Israeli forces at Al-Mansoob checkpoint at the eastern entrance to the town of Al-Esaweh in Jerusalem and then being denied access to the hospital by Israeli forces. 2. Injuries: 195 civilians injured in the West Bank, 2 from live ammunition, 37 with rubber coated metal bullets, 136 cases of suffocation from tear gas and 20 injuries by beating. 1- 21-year-old Muhannad Al- Aqabi from Hourah in Al-Naqab was martyred today after taking part in both a stabbing and shooting action at the central station in Beir Al- Sabe’. The Israeli forces suspect that he took a soldier’s weapon after stabbing him, so the police shot two suspects at the scene only to later realize that one of them was an Eritrean worker that was mistakenly shot. 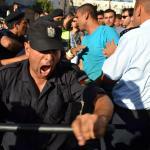 This action has led to the death of an army officer and the wounding of ten; two of them are in a critical condition. - Shawqi Jamal Obaid, 37 years old, from Jabalyia martyred today after being wounded in clashes with the occupation forces in Beit Hanoun last Friday. - Yihya Farahat, 23 years old, from Al Shuja’yah martyred today during clashes at Beit Hanoun’s checkpoint with a bullet to his head by the occupation forces. - Mahmoud Hatem Hamedah from the east of Al-shuja’yah, martyred today after being shot by the Israeli forces during clashes near NahelOzz at the east of Gaza. - Iyad Khalil Mahmoud Al- A’wawdeh, 27 years old, from A- Mureq in Hebron, he was martyred after being shot under the claim of attempting to stab a soldier at Al- jourah in Hebron during clashes. - Ihab Jihad Hinany, 19 years old, from Beit Foriek east Nablus, he was martyred after being shot with a bullet to his chest during clashes at Beit Foriek’s road junction. 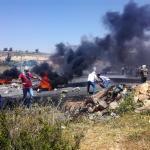 The daily clashes continue, as does Israeli repression with the implemention of the group punishment policy, which includes house demolitions, land confiscation, the annulment of the residency documents for the Palestinians who live in Jerusalem. The young Palestinian Basim Ragheb Sider (20) from Hebron was executed by the Israeli occupation forces at Bab Al- Amoud in the center of Jerusalem under the accusation of having allegedly stabbed a soldier;later on, the the Israeli Occupation released some pictures that turned out to be fake and the boy did not have any knife as they claimed. According to eyewitnesses who were present on the scene of the murder, the Israeli soldiers fired more than ten bullets from a close distance without him stabbing anyone as the Israeli police claims, but soldiers left him to bleed and prevented the ambulance from reaching him until he bled to death. Ahmad Fathi Abu Sha’ban (23) from Ras Al-Amoud neighborhood near the central station in Jerusalem was executed after being shot for allegedly stabbing a settler. The police claimed in a statement that one of its private forces shot an Arab young man who tried to stab a settler, which led to his killing right away. However, an Israeli witness confirmed that Abu Sha’ban did not have a knife and did not hurt anyone, one of the settlers started to shout, calling him a “terrorist” and so a policeman shot him from a zero distance. News Bulletin of 13th October 2015. 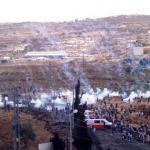 Resistance and Repression continues. 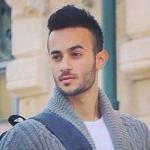 Baha E’lyaan, (23), and his friend Bilal Omar Ghanem (23), ,both from Jabal Al-Mukaber in Jerusalem were involved in a stabbing and shooting attack on an Israeli bus.Baha was killed and Bilal was severely wounded. 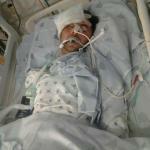 Bilal is still in the hospital for treatment and he is under arrest. Ala’a Abu Jmal, (33), from Jabal Al- Mukaber in Jerusalem, ran over two settlers and then got out of his car and stabbed others. Mutaz Ibrahim HamdanZawahreh, (27), from Al- Dhaisheh refugee camp in Bethlehem,was shot with live bullets in his back by the Israeli forces during clashes in Bethlehem. He was transferred to a hospital but the doctors’ attempts to keep him alive failed. While the specter of a Third Intifada keeps rising, the international community concerns and confusion, the number of people killed and injured in the Occupied Territories by Israeli aggressions, escalates with no brakes nor distinctions. Below are reported the main events occurred during the day of 10th October in West Bank, Gaza Strip, and 1948 Occupied territories. 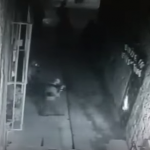 Surveillance video of Israeli soldiers breaking open the door of the PCR/IMEMC Palestinian News Office before they entered and ransacked the offices. Because it happened at 4 AM Sunday morning, 11 October no staff were in the building. Israel has ransacked and taken numerous files from IMEMC in the past. 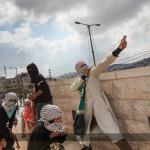 The demonstrations and protests have been spreading all over historic Palestine. They have intensified in the Palestinian cities across the Green Line and protests in Gaza have cost six lives in one day only. 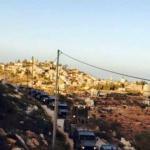 The revolt is continuing as settlers have attacked Palestinians, especially in the Old City and Salfit area. As Israeli authorities are shooting live ammunition and engage across the line in extra-judicial killings, the mayor of Jerusalem has asked Israeli-Jewish citizens to wear their arms while in the streets. The daily news reports continue. Below you can find a summary of what went on during last Thursday 8th of October. Our corrispondent present in the Occupied Territories due to an electricity cut and poor internet connection, only managed to update us today. A brief bulletin of the multiple clashes and their consequences can be read below, giving you an idea of how widespread the Palestinian revolt against the Israeli oppressor is becoming. 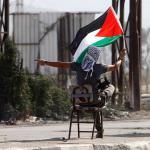 Resistance and Repression in Palestine. The rebellion unfolding in the West Bank and increasingly across the Green Line is a direct response to Israel’s intensified ethnic cleansing of the Palestinian people and its almost seven decades old regime of occupation, apartheid and settler colonialism. 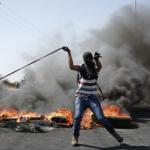 It has seen yet another day of protests and murderous attacks by Israeli forces and settlers. Below are the main events of October 7 in the Palestinian grassroots attempt to stop Israel’s plans to reduce the Palestinian people to shattered Bantustans in the West Bank and an open-air prison in Gaza. 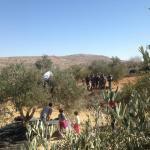 Following the events of the previous days clashes continued to unfold, finding no rest. 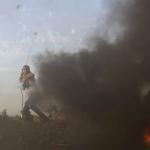 A spark has been lit and the present-day Palestinian uprising continues against the Israeli colonial regime and daily repression. 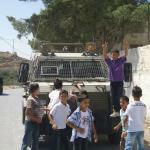 Below is a summary of what happened Tuesday across the Occupied Territories of the West Bank. 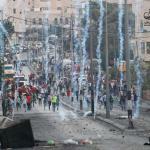 Since the middle of September, violence is escalating throughout the Occupied Territories and East Jerusalem. 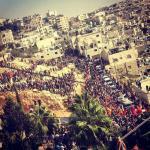 A huge number of Israeli military forces have been deployed and distributed in these areas. During the past week, amongst the clashes, Israel hasn't missed the occasion to show its ability to execute in cold blood unarmed Palestinian youths. All the neighborhood are present. The street is embellished with flags and banners. Family, friends, and neighbors are gathered. They are waiting for a hero. 6 Palestinians have been killed and 900 arrested in Jerusalem since July this year. 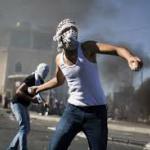 Only during November, 111 of the people have been arrested in Jerusalem and thousands injured. 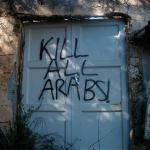 The Israeli occupation has escalated its crimes against the Palestinian people and their properties with attacks that range from stealing lands, to ever more brutal racist assaults by settlers and a never ending series of racist legal and administrative actions approved and implemented by the occupation government, especially in Jerusalem. Below is a summary of some of these attacks that have been documented. 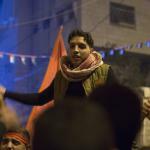 On February 22nd, during a protest in support of the hunger strikers in Aboud, 22-year-old student Mohammad Assfour was shot by the Israeli military, becoming the another martyr in the recent prisoners Intifada. 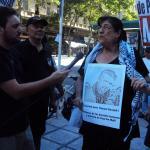 The protest gathered 70 Palestinians showing their support and solidarity for the political prisoners who have been in a hunger strike. 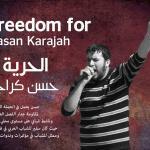 Free the human rights defender and Stop the Wall activist Hassan Karajah! 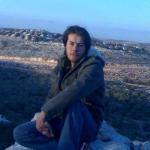 In the early hours of this morning, Wednesday 23rd January 2013, Israeli Occupation Forces (IOF) arrested Hassan Yasser Karajeh, a 29 years old youth activist in the Stop the Wall Campaign, violently breaking into his home in the West Bank village of Safa, west of Ramallah. This new arrest of Stop the Wall staff comes as Palestinian popular resistance against the increasing Israeli settlement construction and forcible expulsion of Palestinian communities is gathering pace.